The prefix “re” added to any word means “again” or “again and again”. 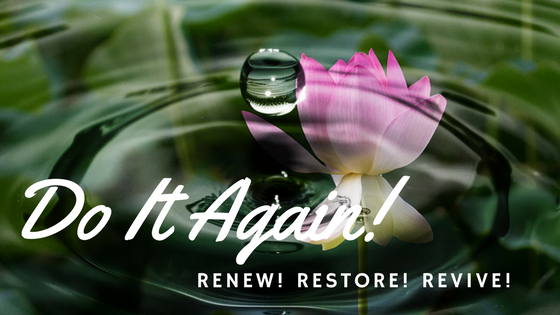 God has an “again and again” desire and purpose to renew, restore and revive each one of us! As I look in the mirror grey hair, wrinkles and sags declare the reality of more years behind me than ahead. As you stretch out the measuring line over your life, where are you? Are you beginning? Are you half-way through? Time on earth is finite. Honestly, no matter where we think we are, our time is uncertain! Daily pressures and responsibilities have a subtle but pervasive way of distracting and pulling us away from the eternal qualities that really matter: faith, hope and love! Lord I ask for a renewing of our minds, tenderizing of our hearts and focusing of intentions on what will remain eternally. Unite us with the your highest values, Jesus. Do it again Lord! May our lives be marked with eternity – imprinted with your value system. Before God created heaven and earth, before anything existed that now is, God knew you and saw you complete – perfectly you. You were beautiful, purposeful, fantastic and amazing in every dimension. You were a one-of-a-kind rarity! A special design! Often life is cruel, relentlessly eroding us of value and distinction. Every day I encounter people at various levels of brokenness and disengagement, without identity, or personal worth. Look around and you will see them too! Ask God what His thoughts are toward you. Ask Him what your next step is to begin to walk into the dream and destiny that is planted like a seed in your heart and soul. Don’t read another word! Ask! You will be surprised by His lavish response! He is listening and ready to water that seed within you with truth! Lord restore this beautiful one to his/her divine purpose. Speak again the dream and design You have written for him/her. Erase the abuse, effects of monotony, weight of weariness, wall of discouragement, and marks of debasement from this life. Reconnect them to your heart and purpose. Realign them to a position and place of joy and fulfillment. Restore each one to the strength and perfection of their calling and design. What areas of your life might need “reviving”? Ask God if there are places where your conscience has become calloused. Are there areas where you once moved in strength and confidence, but lack vitality today? Are you tired of being tired in a dimension of your life? There are several that God has been pinpointing in me and my relationships. Some spiritual gifts have been kept strong through constant exercise and risk. Unfortunately, I’ve relaxed in other ways and my spiritual muscles are atrophying. Atrophy means “gradually decline in effectiveness or vigor due to under use or neglect.” It isn’t pretty, but is a fitting description of spots in my life for God’s gentle, yet powerful, ignition of life to revive to full potential. Broken crayons may need a little sharpening, cutting away of the outer layers, to expose the vibrant core. Nevertheless, once the excess is gone, the true colour appears ready to imprint and create beautiful on everything it touches! He wastes nothing in your life or mine! Get ready! Revival is coming! Expect and anticipate revival in your heart, your community, your church, and the nations! God is doing again what He has done before! He is breathing life, hope and purpose back into His people. He is drawing those that don’t yet know Him into this beautiful relationship with Him. Build in us, Lord, a childlike expectation for you to do it again! The answer is “Yes!” Yes, He will! Yes, He is! A great tidal wave to renew, restore, and revive is approaching. In fact, it is already transforming the global landscape in proportions we cannot yet fully define. God is beginning right here with you and with me! Lord we agree with your heart! We align ourselves to your timing and purpose! ← Worth, Benefit, Profit, or Value? Is It Worth it? Jesus is Worth It!